February 2013. 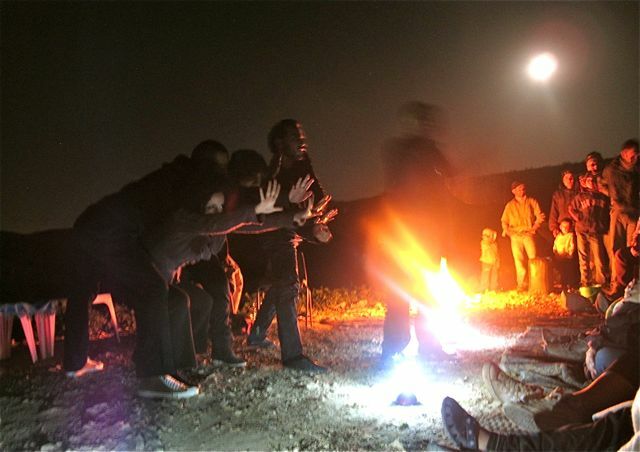 We are in the gentle hills of the Jordan Valley, under a starry sky, in a Bedouin village of several families on land that they have owned and grazed for centuries. The air is pungent with sheep dung. There is no electricity in the village—they are not permitted to have electricity, nor to build permanent structures—but along the ridge of the hills just a couple of hundred yards away marches a line of poles and wires carrying electricity to the nearby Jewish settlements and to the massive army base just down the road. The Freedom Bus performers and their helpers are setting up a stage area. They’re going to do a Playback Theatre show under a spreading doma tree hung with lanterns whose light is augmented by a blazing campfire on the side. The team is traveling with ten or so internationals on a three-day solidarity trip, visiting Bedouin, farmer, and herder communities, planting olive trees and making mud bricks, eating together, and doing Playback shows so that the villagers can tell their stories. I’ve joined them just for this evening, driving from Jenin with Abu Naji, a famed Zajaal poet whose traditional form of improvised poetry and song will play a part in the performance. We drove through lush farmland and villages and into an exquisite valley of scattered olive trees and wildflowers. And then we see Israeli soldiers walking down the road, guns at the ready. A little further there is a checkpoint. Cars are stopped, engines off, people waiting in the warm breeze. The word is that they have closed the checkpoint because two boys in the last village threw stones at the soldiers, who are now hunting for them. In the car we are quiet but anxious. If we can’t get through this checkpoint it will take several hours to reach the village. We’ll be late for the performance. After twenty minutes the soldiers start letting cars through. They peer at us, suspicious, but let us go. Abu Naji and Adnan in the front seat are on their cell phones, trying to find the village where we are heading. The instructions lead us onto a small side road, and then into a field. We follow a long stony track, driving very slowly. Up in the crook of the hills we find the village, and our friends. A gaggle of excited children surround Fidaa, a storyteller from the Freedom Theatre who has been telling stories and playing with them since the team arrived earlier in the day. They chant together—the children know long verses by heart. They leave for school at 5:30 each morning, walking a long distance to the bus: the village is not permitted to build their own school. I sit on a bench that someone has dragged down to the doma tree and after a while the children come and join me. One tiny child snuggles close and holds my hand, gazing up at me with solemn eyes. The others are shrieking, apparently convinced that if they raise their voices I’ll understand Arabic. We get as far as exchanging names and the number of siblings we each have. They have many—seven, eight, nine. A few days ago I finished teaching a Playback Theatre workshop in which the Freedom Bus performers took part and we are happy to see each other again here in the valley. I watch them preparing to perform, in the dark, in the dirt, in this rather chaotic atmosphere, and I marvel at their dedication and good humor. They are fueled by their passion for resistance and justice. As Palestinians they themselves live every day with the humiliations and deprivations of the occupation. They are committed to reaching out to the people of this valley who are victimized perhaps the most of all—the poorest of the poor, invisible even to many other Palestinians, voiceless and powerless, but unshakably determined to stay on their land. Several others speak up, and then Dabdoub invites someone to come to the teller’s chair on the stage area to speak at more length about something from their lives. A middle-aged man accepts the invitation. The soldiers came to demolish his house. He pleaded with them to let him take out some of his belongings first. They refused, and destroyed his house, and beat him, and arrested him. The musician plays his oud and the actors enact the story. Hassan, playing the teller, picks up a handful of dirt and lets it sift through his fingers. The man watches, absorbed, and nods when it is over. A woman comes next. She talks about living in a firing zone. The children are in danger but the soldiers don’t care, she says. We hear later that people from other villages are afraid to come to this one, because of the frequent shooting. It has kept them away from the performance tonight. Abu Naji’s powerful voice interweaves with the action, the ornate contours of his music linking these stories of the present to centuries of music and story in this historic land. The third story is told by a younger man. One day the soldiers accosted him out in the hills. They said that the land was a natural resource and sheep were not permitted there. He argued that the land belonged to him. His family had always grazed their sheep on it. The soldiers arrested him and took him away. They did not give him a chance to find someone to look after the sheep. Later when he was released he took his case to court. After a long struggle his right to graze sheep on his land was affirmed. But now, he said, the soldiers do not respect this decision. They still threaten and harass him. The performance ends with Abu Naji’s voice once more. There is no resolution for these stories, no redemptive vision of change or hope. But there is the telling, and the listening. Someone stokes the fire and the conversations continue.